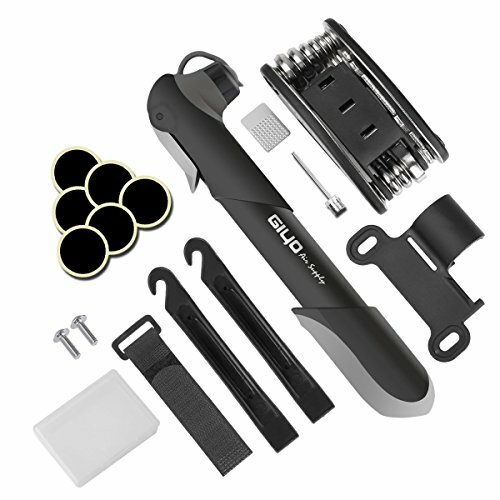 No matter what kinds of bike you have, this multifunction bike repair tool kits can help you fix the problems easily, it is the most functional bike tools for you to repair your beloved bicycle when in emergencies or doing outdoor activities. 1. This compact bike tire pump is made from Aluminum Alloy and Environmental plastic and makes it easy to maintain the air present in your tire. 2. It features a sturdy and durable construction and can be easily attached to bike frames as a mount frame pump, thanks to its superb construction. 3. It is compatible with Presta and Schrader valves with a tight seal that prevents air leaks, even up to 120 PSI. Multi functional repair tool, a perfect accessories and super-efficient tools which comes in handy for general bike repairing or other outdoor maintenance around the house. Slot type screwdriver Phillips screwdriver Sleeve extension rod Spoke wrench Glueless Puncture Repair Kit Included You'll get a puncture when you least expect it, so be prepared. Get riding again in minutes with this Glue-less Emergency Puncture Kit. If you have any questions about this product by Giwil, contact us by completing and submitting the form below. If you are looking for a specif part number, please include it with your message.